Lifetime Camping Tables - 280312 4-foot Folding Tailgate Table. Free shipping to the lower 48 United States for this Lifetime camp table. If you enjoy spending time out in the wilderness and cooking on a convenient table top stove, then you probably realize that putting a hot cooking object directly on a plastic table may not have the best results. Lifetime has come up with a solution to this problem, by adding on a metal grill rack that folds under the table, the 280312 allows you to cook and serve all of your meals without worrying about overheating your table. Do you need a mobile kitchen on your next camping trip? 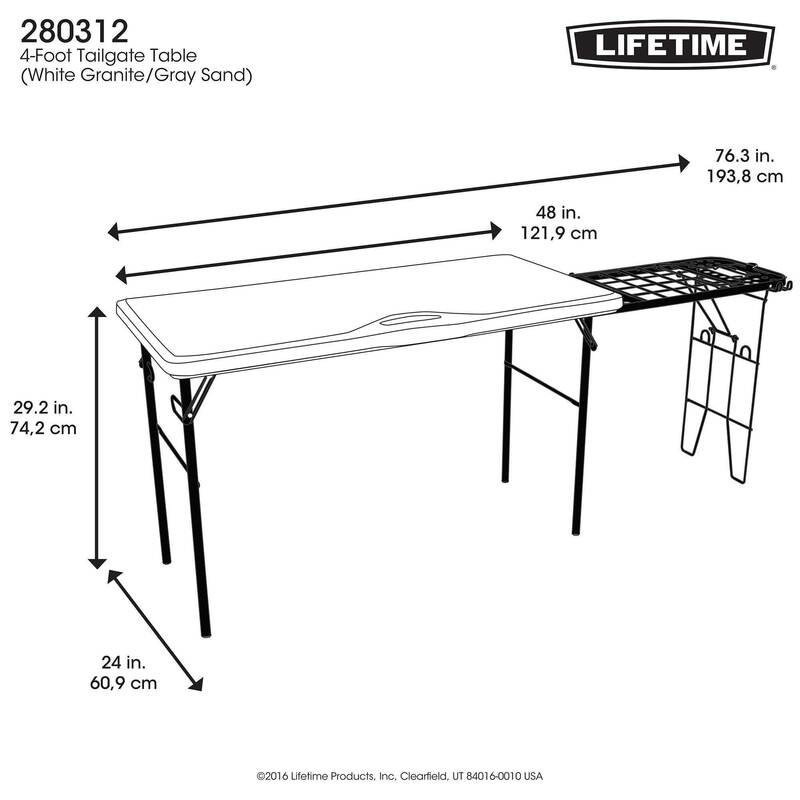 The 280312 Lifetime folding table is just what you are looking for. Like other Lifetime folding tables, this camp table feature a powder-coated steel frame and a polyethylene plastic table top. However, built into the the table top structure is a steel grill to put your cooker on while you work. Organization is made easy with the included trash bag holder, paper towel holder, and utensil hooks. The table fold away easily, the the table top fold in half for convenient, compact storage and transportation. Weighing in at about 40 lbs., the table is easily carried and set up. Order your Lifetime plastic tables here. 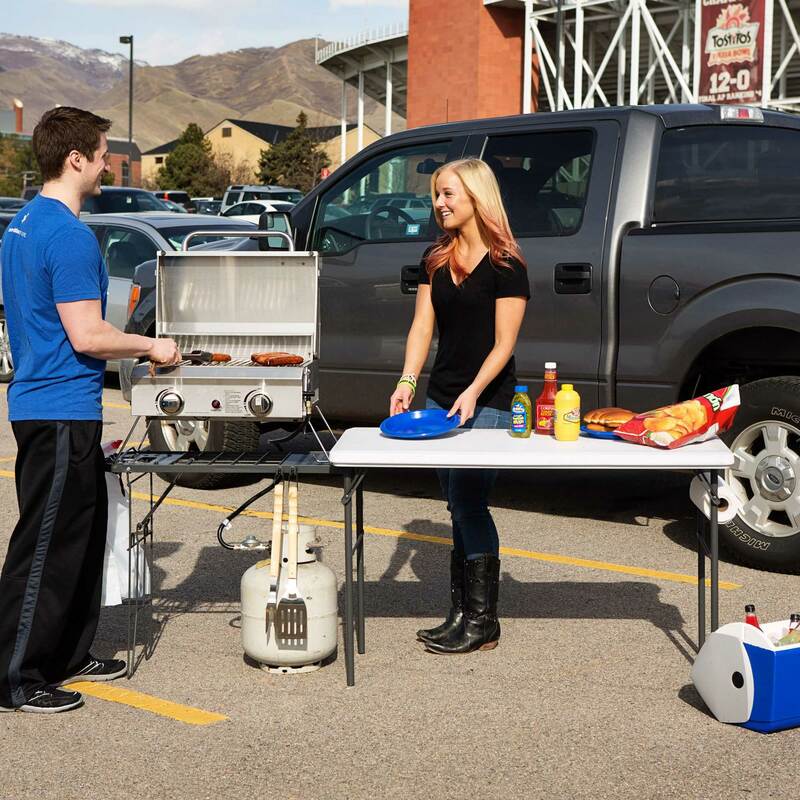 The Lifetime 4-Foot Tailgate Table is the perfect addition to an outdoor barbecue, picnic or tailgate party. Constructed of UV-protected, high-density polyethylene and powder-coated steel, our table is built for the rigors of outdoor use. It is stain resistant, easy to clean, and protected against rusting and corrosion. 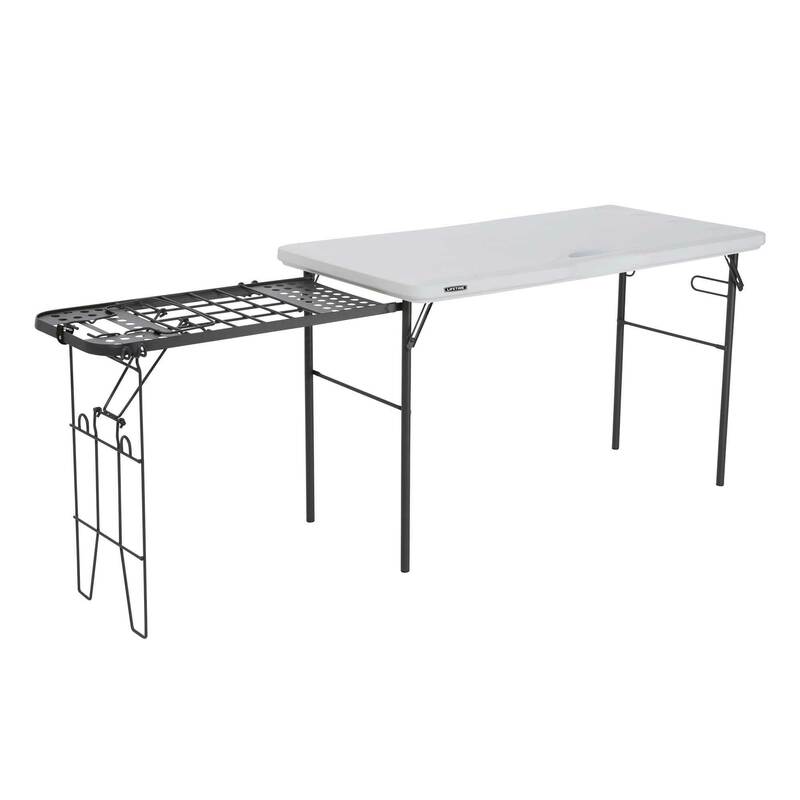 Lifetime's Camp Table features a heavy-duty grill rack that folds inside the table, garbage bag holder, paper towel holder, and built-in utensil hooks, making this table perfect for your next outdoor get-together. 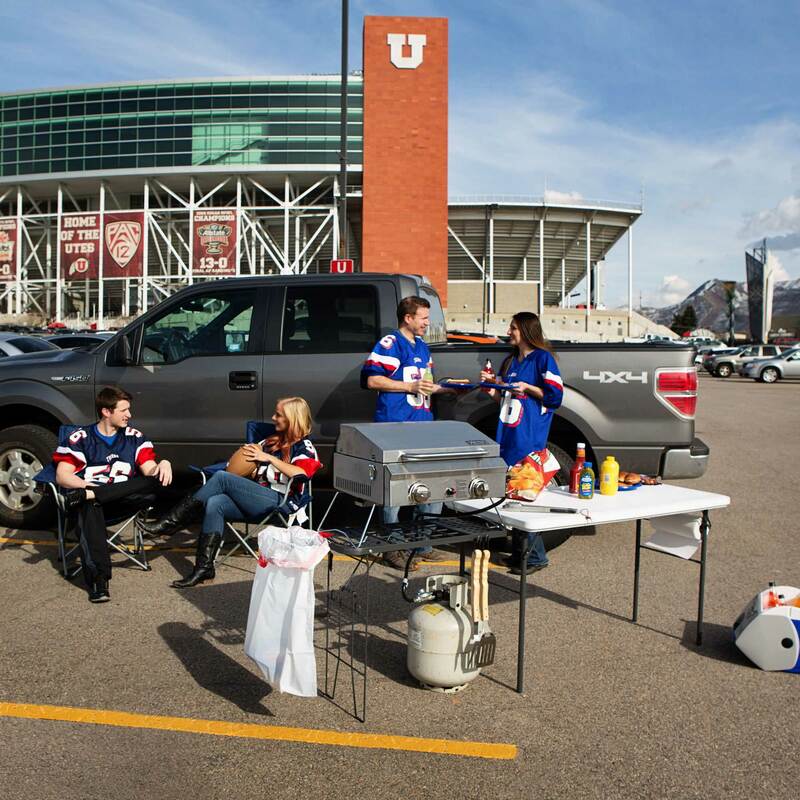 Lifetime 4 Foot Tailgate Table- Features a 48"x 24" tabletop (white granite) and 28.8" x 24" heavy-duty grill rack with a folding frame (gray). Also includes built-in utensil hooks, a paper towel holder,cup holders, molded-in carry handle, and a garbage bag holder. 2-year limited warranty. Individually boxed. HDPE is easily cleaned, typically needing nothing more than soap and water. 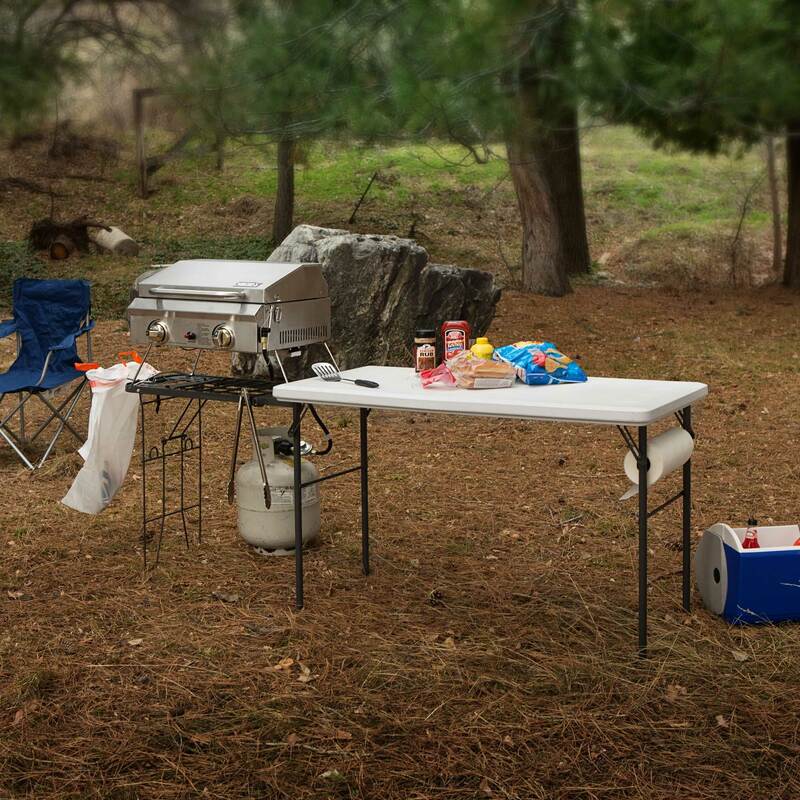 HDPE plastic allows you to easily clean your camping table. HDPE will not fade, crack, or peel in the sunlight. Table top folds in half for easy transportation and storage. Steel frame is powder coated to help resist rusting. Built-in trash bag holder, paper towel holder, cup holders and utensil hooks. Steel grill can support most camping stoves. Steel grill for cooking stove dimensions: 28.3 in. L x 13.8 in. W x 26.6 in. Q: Does the little medal part fold under the white lifetime table? Dimensions: 34" x 28" x 4"